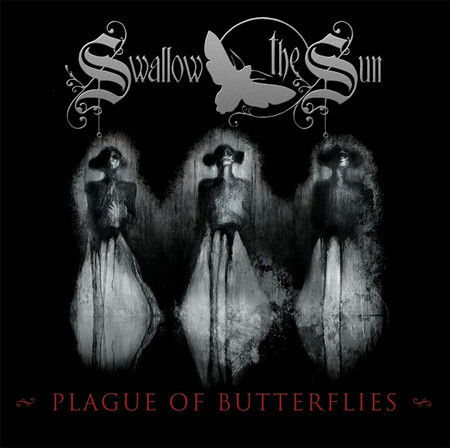 An e-card for "Plague of Butterflies", the new EP from Finnish doom metallers SWALLOW THE SUN, can be accessed at this location. The CD is due on September 17 in Finland, September 22 in the UK and September 23 in the U.S. via Spinefarm Records. A video interview with singer Mikko Kotamäki and guitarist Juha Raivio regarding the EP can be viewed below. Commented the band: "'Plague of Butterflies' is a story about an old hermit, deep woods, loneliness and the plague. It's one song in three parts and holds about 35 minutes of crushing gloom, beauty and despair. Music was originally ordered from us for a really interesting and big project, but the project was sadly abandoned. Because of this we are planning to use the music in different context — namely in a short movie — and we are in search for suitable partners to make this happen. We'll give more info on this later as things move on and wheels start to roll." The album also includes the rare "Out of This Gloomy Light" demo. There were only three demos sent out, so this is really rare stuff and holds some of the darkest and coldest moments ever recorded by SWALLOW THE SUN. "Hope", the third album by SWALLOW THE SUN, entered the Finnish national chart at position No. 3 back in February 2007. The follow-up to 2005's "Ghosts of Loss" was recorded at Seawolf Studios in Helsinki and was mastered at Finnvox studios with Minerva Pappi. The LP features a vocal appearance by Jonas Renkse of KATATONIA on the song "The Justice of Suffering".